Updated: May 7, 2018, 8:54 p.m.
A new line of ready-to-snack products by Stilson-based, family-operated Hunter Cattle Co. has shown up in point-of-sale displays from the Country Music Hall of Fame in Nashville to the Caribbean islands of Turks and Caicos. In the package, Hunter Cattle Dry Aged Beef looks a lot like the various brands of jerky sold in convenience stores everywhere. In fact, Enmarket stores, a Savannah-based chain, were some of the first places the new product showed up in Hunter Cattle’s home area. But the dry-aged beef is different from ordinary jerky, being dried by a slower process. Because the other forms in which Hunter Cattle brings its grassfed beef and pastured pork to retail markets require freezing, the dry-aged product can also make a big difference in profitability. Five flavors of the dry-aged beef snack are sold: MooMa’s Original, Pa’s Peppercorn, Tin Roof Teriyaki, Bonfire Jalapeno and Farmhouse Garlic. Additionally, beef sticks are available in the MooMa’s Original flavor. The size of small cigars, these are sold in two-ounce airtight plastic packages like the other beef snacks. Vinegar and salt are among the listed ingredients for all of these, but they contain no artificial preservatives. At least for marketing purposes, “MooMa” is Debra Ferguson, and “Pa” is Del Ferguson. They are Fretwell’s parents and the company’s CFO and CEO. Hunter Ferguson, for whom the farm is named, is Fretwell’s younger brother. An older brother, Anthony Ferguson, manages the meat processing facility. Several of Debra and Del Ferguson’s school-age grandchildren work on the farm. There are also some employees who are not kin, though they obviously work in a family atmosphere. MooMa’s Farm Store, which is located on the farm, has a tin roof, lending the teriyaki variety a name. “We eat a lot of meals together as a family,” Fretwell said, explaining that “a lot of tasting, a lot of talking” went into the names and seasonings. As for how the idea of a dry-aged beef product came about, she noted that Hunter Cattle Co. started developing various specialty aged meats, such as salumi – which is a more general category than salami – and prosciutto several years ago. Some of this was done in association with restaurants that wanted these products. So the techniques and processing facility were available, and ideas for the shelf-stable snack product grew out of this. Anthony would make batches for other family members to try, so they were eating the dry aged beef on the farm for months before it was introduced to consumers. Distribution took off after family members set up a display of the finished products at AmericasMart in Atlanta in January. “We had a different product than people had seen,” Fretwell said. Orders from the Country Music Hall of Fame and a specialty store in Gatlinburg followed, so the product began reaching customers, including tourists from around the world, through Tennessee. The dry-aged beef went directly international after the Hunter Cattle folks met a buyer who supplies tourist shops in Turks and Caicos, which is a British territory. The seasonings are hand applied as a dry rub before the aging process, she said. When her parents purchased a few hundred acres of farmland in the area east of Brooklet about 15 years ago, the family had done only hobby farming, with animals such as rabbits, llamas and horses, on a 12-acre place at Bloomingdale. The Fergusons were previously in the construction business. Since launching Hunter Cattle they have developed demand for packaged cuts of their beef and pork and a variety of sausages through farm markets, their country store and a few area specialty and grocery stores. 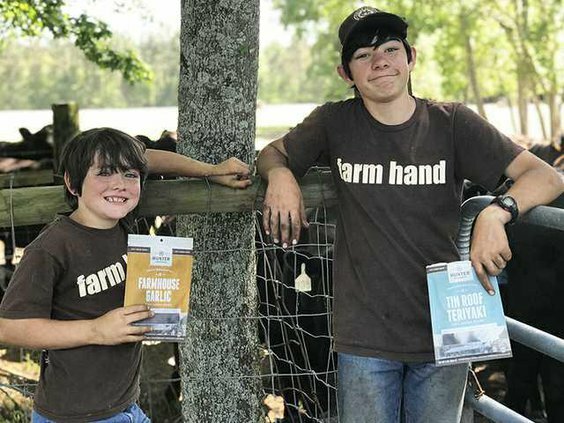 Hunter Cattle Co. has meanwhile become an agritourism calling card for Bulloch County, accommodating a full schedule of farm tours frequented by school, church and scouting groups. The family turned the top of a former tobacco barn into furnished loft suites, often rented by people who pay extra to join in farm chores as part of the experience. The farm’s meat processing facility operates under U.S. Department of Agriculture guidelines and is subject to daily inspection. Hunter Cattle is already expanding its processing facility but doesn’t know yet whether demand for the new products will lead to further changes, Fretwell said.